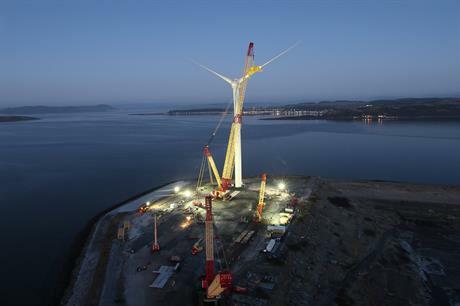 UK: Mitsubishi Heavy Industries has dropped the "SeaAngel" name from its 7MW turbine as construction is completed at the Hunterston test site in Scotland. The turbine will now be known as the MWT 167H/7.0 and MHI has confirmed what was already widely thought that the turbine will not enter commercial production. MHI changed the name so it did not "confuse the market" and to avoid competition with MHI-Vestas' V164-8MW turbine, a spokesperson said. Construction of the turbine was completed at the end of December, and it has now entered a commissioning phase, which MHI expects to be completed in April. Testing of the turbine will continue as it seeks to gain verification of its Digital Displacement Technology (DDT) hydraulic drive train. Following testing of the DDT in Hunterston and at an offshore site in Fukushima, Japan on a floating foundation, MHI said it would offer the drive train to the market – specifically its offshore partnership with Vestas. MHI-Vestas, formed in 2014, is expected to use the DDT in its next generation of turbines. It will now focus its attention on the development of the MHI-Vestas V164-8MW turbine. MHI said the change in focus was down to the V164 being "ready now" and is "fit-for-purpose" while the 7MW turbine was still in early testing phase. "MHI-Vestas is in the right place for round three," the spokesperson said, as the latest UK projects are moving towards contract agreements. MHI-Vestas has already partnered with Dong Energy to supply the V164 to the 256MW Burbo Bank Extension in the Irish Sea.